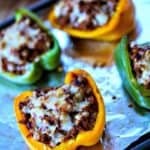 BBQ Turkey Stuffed Peppers. Bake BBQ-flavored turkey mixture in red, yellow, or green sweet bell peppers for a tasty and colorful dinner entrée. 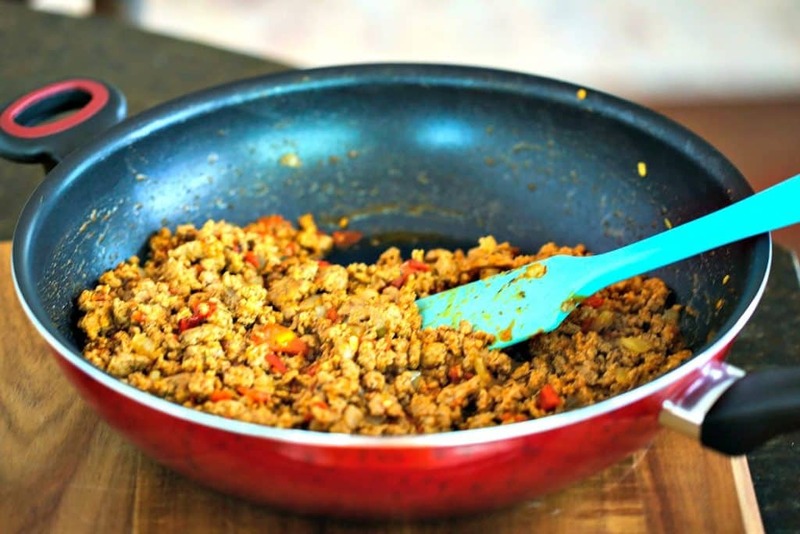 If you’ve shied away from substituting ground turkey in recipes that normally call for ground beef because you didn’t think it would taste as good, try this recipe and become a believer! Making small adjustments in your ingredient choices can make a huge difference over the long run. I’ve been cutting down on salt and cooking with leaner meats and when I do eat out or splurge on a few chips and salsa, it’s crazy how salty everything tastes! I’m learning that a little salt can go a long way. If you’re one of those people who automatically add salt to the food on your plate, taste it first. You may find that less is more! The secret to cooking with ground turkey is to season it well—that doesn’t mean adding extra salt—and to avoid over cooking it so that it doesn’t become dry and chewy. You’ll notice that in the instructions for this recipe, I cook the turkey with the diced onions just until the onions are tender and the turkey is almost done and then add the other ingredients and cook until no longer pink. 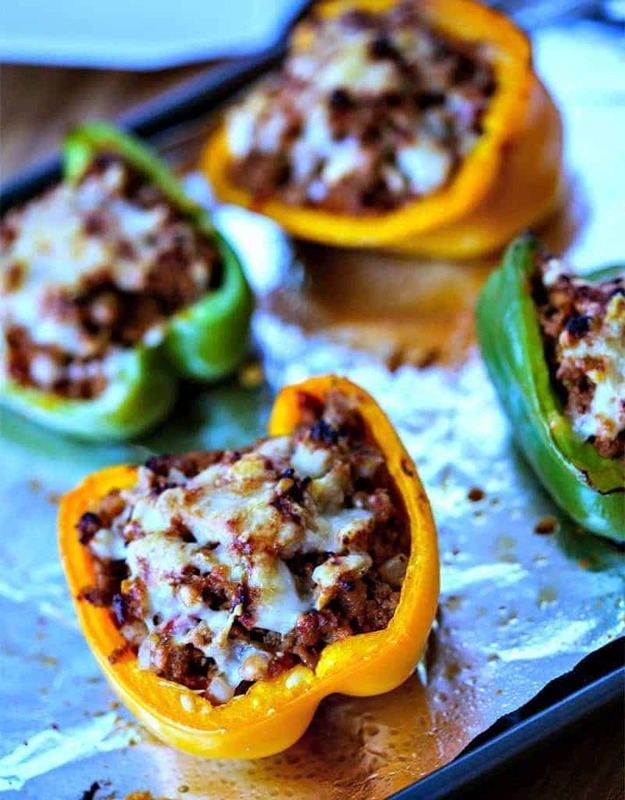 If you’re serving a larger group, double the recipe and use a variety of sweet bell peppers—red, yellow, orange, and green. 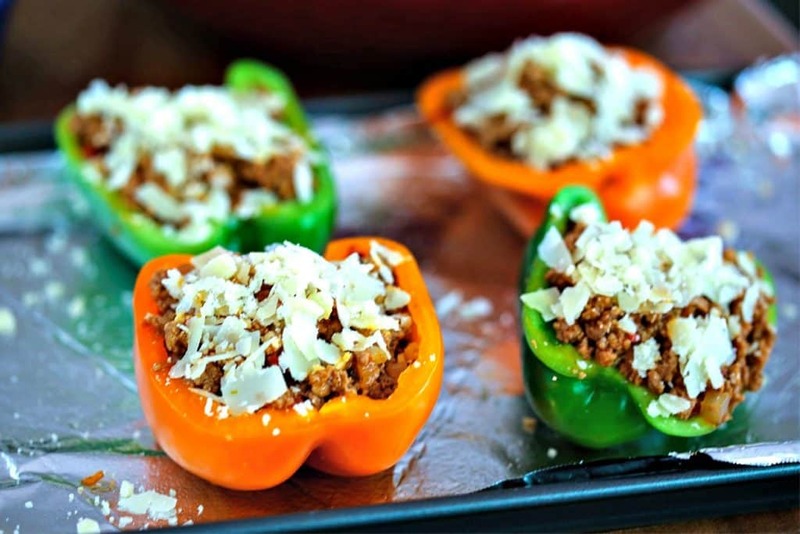 Save time in the kitchen when your guests arrive by prepping the peppers and cooking the turkey mixture ahead of time. 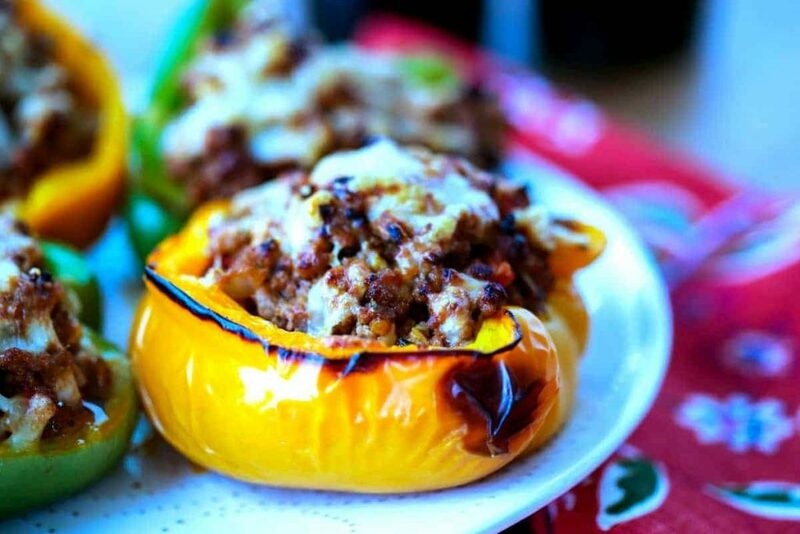 Spoon the turkey mixture into the bell pepper boats at the last minute and bake for just 20 minutes. You’ll impress your guests with how beautiful this dish is on your dinner table…and they’re delicious! Preheat oven to 450 degrees. Line a baking sheet with aluminum foil and spray lightly with cooking spray. Set aside. Cut bell peppers in half from top to bottom and remove seeds. Place on baking sheet, cut side up. In a large skillet, cook turkey and diced onions until the onions are tender and the turkey is almost cooked through. Stir in the tomato and all remaining ingredients (except for the cheese) and cook another 5 minutes, or until the mixture is slightly thickened and bubbly and the turkey is cooked through. 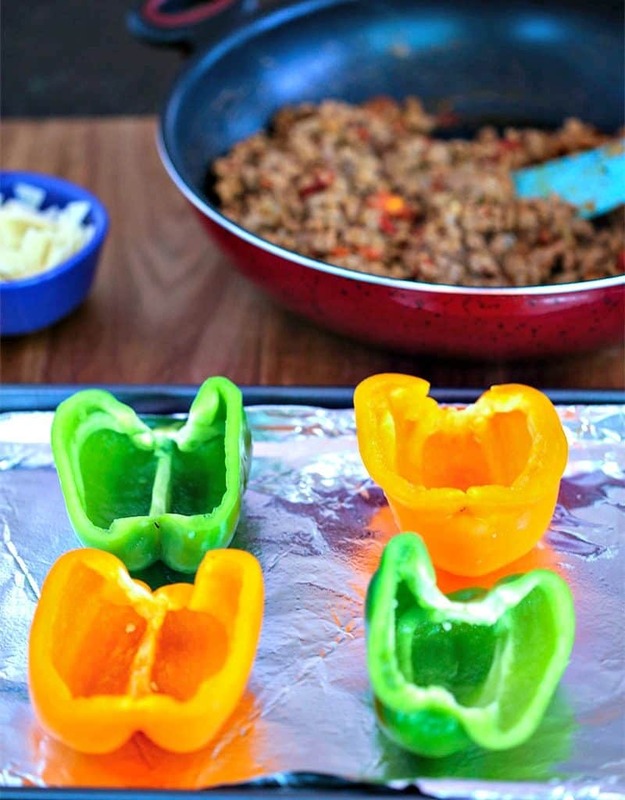 Spoon the turkey mixture into the bell pepper cups. Top with the Parmesan cheese. Bake for 20 minutes or until the cheese is melted and bubbly.